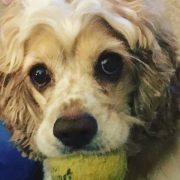 Editor’s Note: Thank you to our dog-loving friend, Caitlin Lilly for her travel tips! If there is one thing the Iron Range has in abundance, its an almost endless supply of parks and trails, ripe for exploration. There are only a few places that I have had to rework plan in order to bring my dogs along. The Mesabi Trail is an absolutely gorgeous, historic walking and cycling trail that stretches over 120 miles of the Mesabi Range. The trail is happy to accept dogs as long as they remain on leash and you do your responsibility to pick up after them. The trail is clearly marked, paved, and there are trash receptacles at each trail head. It’s the best spot to go for a morning or evening walk, and the trail had spurs and trail heads in almost every Iron Range city, most of which have parking for easy access. Be aware of cyclists and even wildlife on the Mesabi Trail. As with all trails and sidewalks, make sure to note the temperature of the ground. In the summer, the payment bakes all day in the sun and can still be hot enough to be uncomfortable or even hurt your pooches paws. This is also something to be wary of if you stop in town anywhere. The Laurentian Divide is located just North of Virginia. It is a beautiful set of walking and running trails that give the feeling of secluded wilderness, easily accessed by the public. I take my dogs here for the perfect evening trail hikes. The sunset seeps through the trees and the forest floor is overflowing with plants and trails to explore.I always make sure to take picture of the trail map that is located at the trailhead. My dogs and I have been known to take trails that look exciting without remembering which trail we were originally on. 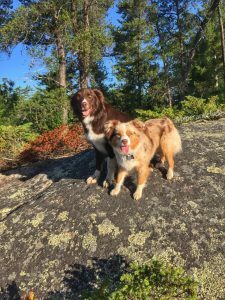 The Laurentian Divide is an awesome place to take dogs if you are looking for something more woodsy or want to feel how big Minnesota’s nature is. The land of 10,000 lakes, eh? 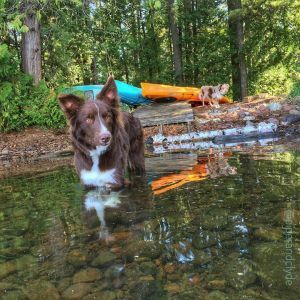 There are plenty of lakes you can take your dog to so they can enjoy the water. There are not many regulations that refer to dogs on lakes that are in boats. If you are planning on bringing your furry friend fishing, please be respectful and keep them on a leash at the boat landing. Also be careful of hooks! 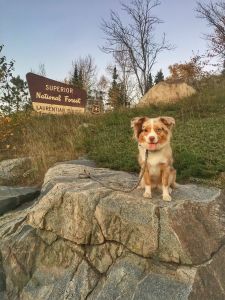 The Iron Range has lakes, rivers, and streams you and your four legged friend can explore! West Two Rivers is a great place to take your dog on a leash and hit the outdoors, as is Carey Lake, with about four miles of trails and plenty of places for your pup to take a dip. If your adventure on the Iron Range is so amazing you’d like to spend another day, we’ve got campsites that are ready to lodge you and your dog. There is nothing more Minnesota that enjoying a campfire under the stars with my dogs by my side. Most area campgrounds allow household pets that remain on a leash. Many hotels are also dog-friendly with prior approval. 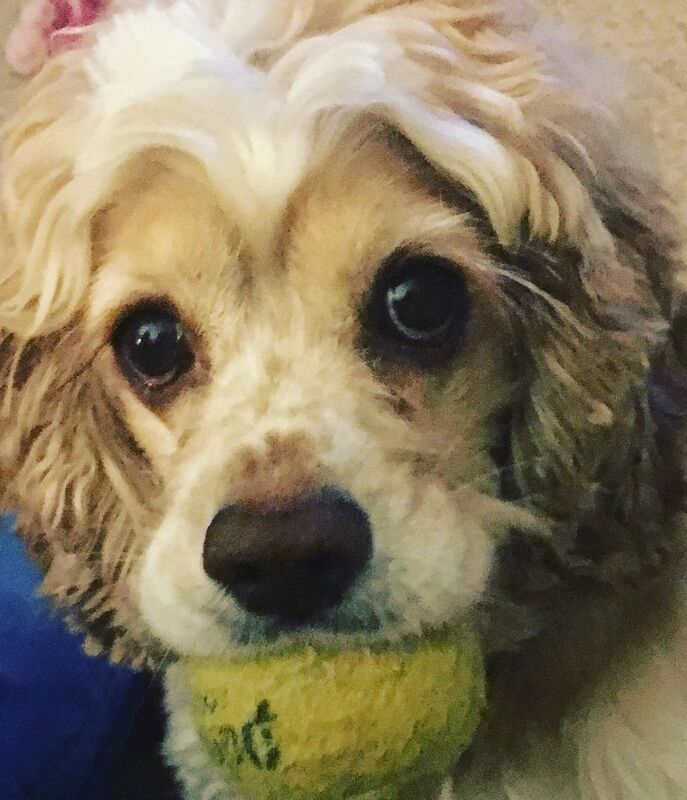 And, if you can’t or don’t want to leave your dogs alone, there’s a doggie daycare option in Virginia. Grooming by Jane accepts walk-ins Monday-Friday, and is the perfect place to park your pooch while you take in a museum, event or other activity. 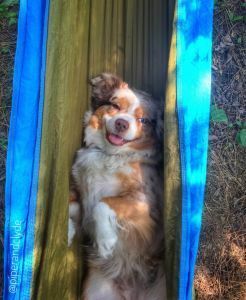 There are many different ways to enjoy the Iron Range with your dog. Please be mindful of your dog’s bathroom business and bring a baggie to remove it from where pedestrians may walk. For more information about traveling with pets on the Mesabi, call 218-749-8161 today!